You don’t need to be rich to travel New Zealand. It is the best backpacking country in the world and one reason is because you can live very cheaply! There are several ways to work for accommodation in New Zealand, which means working just a small amount of hours a day in exchange for a place to stay and a bed to sleep in. Very often, working for free accommodation is done for the experience with the money-saving part coming second to that. While one option will have you working with like-minded people and making friends for life, another option might have you working with locals and immersing the Kiwi culture. It’s all part of the New Zealand gap year experience, so take a look at descriptions below to see what opportunities await! One thing to note is that you do need a work visa if you are working in exchange for accommodation and/or food. Check out our working holiday visa page to see if you qualify for a working holiday visa. WWOOFing is a term generally used to describe the act of working on a farm for food and accommodation. It derived from the WWOOF organisation, which stands for World Wide Opportunities on Organic Farms. Having a membership with WWOOF New Zealand is a popular choice amongst backpackers and working holidaymakers in New Zealand because the WWOOF New Zealand website has a vast database of host profiles. With reviews and detailed descriptions featured on hosts’ profiles, it is a good way to find reliable people to work for, as well as seeing what jobs are expected of you. After all, you will be living and working with them! Similar deals can be found on job listing websites, usually under the heading “WWOOFers Wanted”, or on websites like WorkAway and HelpX. This is the most typical backpacker “work for accommodation” option and for good reason! Working in a hostel makes it easy to befriend like-minded people, yet get your cultural fix by meeting people from all over the world. Working for accommodation in a hostel generally means doing some house-keeping in a morning in exchange for a bed in a dorm-room. 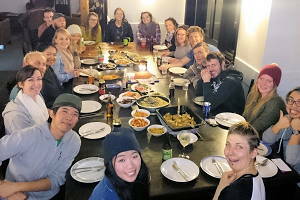 It’s an opportunity to see what long-term hostel life is like in New Zealand, which a lot of travellers really value during their time here. Some backpacker hostels will advertise “work for accommodation” positions online, but the most efficient thing to do is to simply go into a hostel and ask! This is a great option to gain more childcare experience while saving money. An “Au Pair” is a foreign person (that’s you!) who lives with a host family to primarily look after their children and possibly do house chores in exchange for food, accommodation and a small allowance. Some full-time jobs just happen to have free accommodation as one of the perks of the jobs! Luckily for backpackers, a whole bunch of jobs are ideal for working holidaymakers in New Zealand, such as work in hostels, hotels, motels, campsites and lodges. Farm work, from livestock work to fruit picking, also has some free accommodation opportunities. So keep a lookout for these little money-saving perks when finding a job in New Zealand! The Department of Conservation (DoC) oversees the maintenance of New Zealand’s natural environment, wildlife, walking tracks and historic buildings. They essentially play a huge part in keeping New Zealand looking stunning, which we backpackers are obviously very grateful for! Much of their work is voluntary, which is another cool way to experience the New Zealand outdoors while giving something back. Some projects provide free accommodation, which will be specified on their project descriptions. 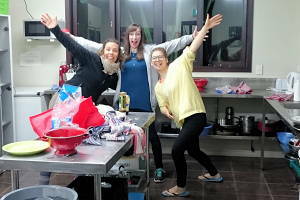 Check out this article on Backpacker Guide.NZ: how to volunteer for DoC. Finally, you can find a place to sleep for free (or a small price) on the road or on the water. Sailing is very popular here in New Zealand with some skippers looking for a crew to go on multi-day voyages, either to work or just for company. Searches can be made on websites, such as Find a Crew and CrewSeekers. If you are sticking to dry land, some backpackers are travelling in their campervan (or converted car) all over the country and are looking for people to share the fuel cost with. Joining them is fun way to see New Zealand during the warmer months without having to worry about paying for hostels. Even some campsites are free or under $10 so keep an eye out for those. Connect with the backpacker community directly on Facebook groups like Backpacking in New Zealand to see who’s looking for travel mates and to advertise yourself as the perfect backpacking buddy!